These three indispensable wardrobe-makers - together or alone - create a look with relaxed panache. 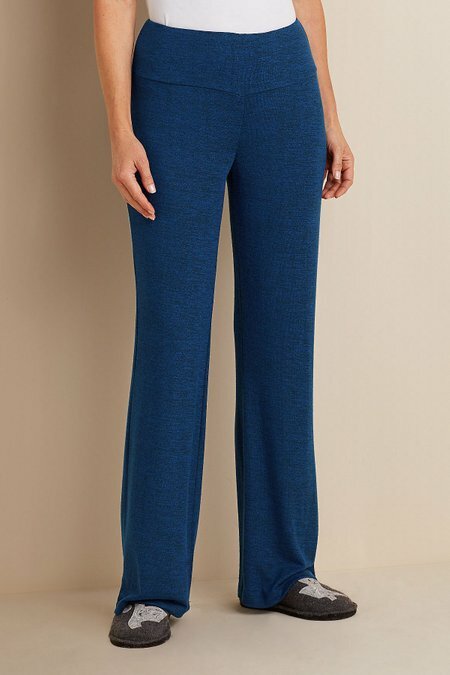 Made of decadently soft jersey knit with subtle, space-dyed stripes, each piece is thoughtfully designed: side insets give the pullover a gorgeous drape; pull-on, elastic waist brings easy comfort to the pants; and the cardi boasts a pieced collar, side pockets and a breezy, open-front pointed hem. Wear our Looking Good pieces separately, or pull them together for an instant outfit. Sits just below natural waist. Misses 30" inseam. Rayon/poly/spandex.